AgroAtlas - Relatives - Elymus caninus (L.) L. - Bearded Couch. Family Poaceae Barnhart, genus Elymus L.
Agropyron caninum (L.) Beauv., Roegneria canina (L.) Nevski, Triticum caninum L.
Short-rhizomatous perennial plant 40-130 cm tall. Leaves up to 1.5 cm wide, flat, with sparse long hairs above, glabrous beneath, more or less scabrous. Spikes rather long, 10-20 cm, slightly drooping. Spikelets 2-5-flowered. Glumes with 3(5) veins scabrous with spinules, with short fluff inside. Lemma glabrous at back, very rarely with few spinules in upper part, with flexuous awn 1.5-1.8 cm long, equal to or longer than lemma. Palea with dense short spinules on ribs, scabrous between ribs. Cross-pollinated anemophilous plant. Flowers in June, fruits in August. 2n=28. European part of the former USSR (rare in extreme southeast), Crimea, Caucasus, West Siberia, East Siberia (south), Central Asia. In fir, spruce, aspen and mixed forests, birch kolki (insular forests), forest glades, flood-plain meadows, riverine thickets, near thermal springs, up to upper montane zone. Kovalevskaya SS., ed. 1968. Manual of plants of Middle Asia. V.1. Tashkent. 226 p. (In Russian). Fedorov AA., ed. 1974. Flora of the European part of the USSR. V.1. Leningrad: Nauka. 404 p. (In Russian). Pavlov NV., ed. 1956. Flora of Kazakhstan. V.1. Alma-Ata. 354 p. (In Russian). Malyshev LI., Peshkova GA., eds. 1990. Flora of Siberia. V.4. 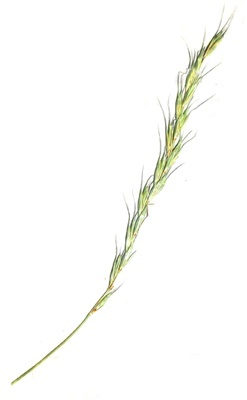 Poaceae (Gramineae). Novosibirsk: Nauka. 361 p. (In Russian). Malyshev LI., Peshkova GA., eds. 1979. Flora of the Central Siberia. V.1. 536 p. (In Russian). Meusel H. et al. 1965. Vergleichende Chorologie der Zentraleuropischen Flora. Jena. 583 S.